Discussion in 'Digital Photography' started by dmw16, Oct 24, 2014. Sorry for the dramatic subject here, but this is something I've been pondering over for the past few months and would welcome inputs. My wife and I had our first child a little over 8 months ago and we've taken (I'd guess) well over 1000 pictures of him between both of our iPhones and my dSLR not to mention a lot of videos. They all go into Aperture and when family comes we fire up the Apple TV and airplay from my laptop over to the TV. And that's ok. But somehow it just doesn't deliver what I'm looking for. My wife's family has tons of photo albums with names and dates jotted on the back and it's a lot of fun to get them out over the holidays and flip thru them. There aren't as many pictures but somehow they all seem more real and meaningful. What I am trying to figure out how to do is capture that same experience with all the digital content I've generated? I am leaning towards getting albums and printing the photos, but then what about the videos. I'm just waxing philosophic here to an extent, but I'd love to hear how you all share your media. I'm guessing it's nostalgia, because in my opinion, no album can compete with a digital slide show on a 1080p or 4K TV, or a 720p or higher resolution projector. There is no reason you can't create both a physical album and a multi-media file or disc to play. The album might be something where you collect up your files and send them to a specialty printer or - if you are inclined, get a quality printer that uses "archival" inks along with quality paper. For TV presentation, there are various software available to handle video and still images. In fact, you could do a mix of video and slide show (of the stills). Just be sure to get archival quality DVD discs and learn to master the software to author the discs. These photos are lifelong memories. I would go with some sort of hard copy media rather that digital. 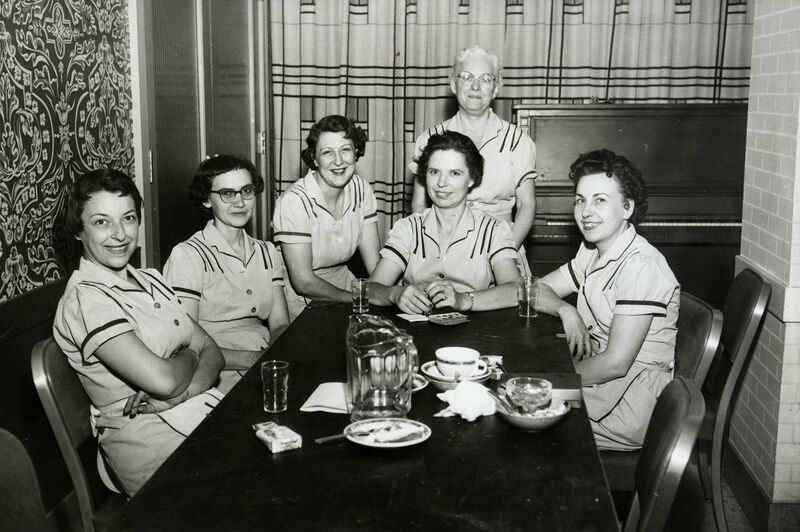 This is a photo of my Mom and her coworkers from the '50s that I keep at my desk. If it was a digital file, I'm not sure - no, very sure - it wouldn't be readable today. Quality is less important than the memory captured. Shots like this are markers in the timeline of life. My mother is the third in the back left. I really like photo books. I love the quality, professional look and ease of layout/design. They can be done through iPhoto and hopefully will be done through Photos in the future. Photo books are inexpensive and make great gifts. Of course his doesn't help with video but I would much rather pass around a book than a laptop or iPad. Agree. Photo books are really nice. Better than showing your work on an iPad. Photobooks can be really nice gifts and such but alas, they are not always sitting in the realm of archival. I would strongly urge those that like them to find out more about their ability to hold up over time. Things to consider - type of paper used, type of ink, book binding materials and glues. Is it possible to have a relatively archival photobook - yes. Actually the printed photo can be much higher resolution then any current display can show. But this only matters if you have a good camera and technique. Really prints are just different media. 1) files always exist on no less than three different physical media. 3) The above must remain true even DURING a backup. So if your backup system first erases the media or requires you to move an off site copy home to update it then you need more copies. One system that follows these rules is to enable Time machine to an external disk drive and also rotate an offline copy to the office at work. This means you have four copies. A cloud based backup can work too, like Backblaze or Carbonite. Even with good backups you have to copy/convert the media files every few years as file formats change so that you can play the files on current equipment. Few people bother to do this so I expect that in 100 years there will be few 100 year old photos. 3) The above must remain true even DURING a backup. So if your backup system first erases the media or requires to to move an off site copy home to update it then you need more copies. Nicely stated. I love a good print and making sure there is a file to print from over the years is really a good point about preservation of the past. I am going to start an album I think. It doesn't take away from digital, but there's something I love about tangible photos. The other thing with digital, and this is maybe just my issue, is I tend to have lots of digital pictures so it's like "here we are at the park...park again...here's another at the park...and the park." Don't forget to be in the moment with them! You're not just "that guy behind the camera". This is a fine line and I think as I realized and then worked on it I became a better photographer for it. You don't need 27 shots of your kid blowing out birthday candles. You stay behind the camera too much, it takes too much time in post picking a good one and you end up saving too many. Don't fall into the digital trap and really work on limiting the repeat shots you take and have a plan for getting that one great shot and getting it right. I think this is why older albums are sometimes more powerful emotionally. Each image is usually unique and totally different than the others. I think just like a Pro you have to be willing to have high standards and discard shots that don't make the cut. This process of whittling them down to the really good ones makes the ones that you keep even more signficant. Then when you choose to share or display them somehow you don't struggle as much with which ones or how. I've struggled with how to diplay digital content as well. So far the main ways are we keep a Zenfolio account that family can visit online and see favorite images organized by year. Family can have them printed from there if they want. I've been having a book made yearly of our favorite pics from that year (each book ends with the birthday party). Every now and then, like others have said, I'll have a book made of a special occasion or a vacation. If we have family over for the holidays or some event I'll let a slide show play in the background on the TV and people can watch if they want to. Lastly, ChrisA gave some great advice. If you haven't panicked yet about loosing your digital pics...you will. A solid backup plan is a must. Digital content can easily be a lasting memory. It's when you have too much of the same stuff (very easy with digital) that you lose the uniqueness and value of each photograph. Slow down and take less, but more meaningful shots. With digital, I find myself lacking in getting things printed. Year ago I'd take 20-40 rolls of film on vacation and have all developed/printed. and make albums. With digital, I tend to have lots on the computer but less in my hands. When my son was born 5 years back, i was taking lots of photos. I wanted to surprise everyone and made a 30 minute slideshow movie with music (made in iMovie) and put together a DVD to play at his 1st birthday party. Everyone liked it and since then I've been doing that every year. Now with 2 kids it is a little harder but knowing how to use Keywords is a big help. Also, every Christmas we put together family "yearbook" photo book and hand those out to parents/grandparents and keep one. My wife makes photo books for each of our twice-a-year photo sessions with a photographer (basically photoshoots around each child's birthday Spring/Fall). She will put together larger (size and page-count) photo books of Vacations. And then sometimes our weekend trips or "Summer Fun" gets put into a Photobook. On our bookshelf with DVDs/Blurays are copies of these photo books, and each DVD for a child's year. I've created 720/1080 Digital versions of the movie to just stream through iTunes to the AppleTV. I love doing the photo books. it is very reminiscent of the albums of yesteryear. Growing up, we'd have Slide Night with "actual" slides and projector. it was neat. And I think the "digital" slideshow (I do photos and movies) is a great way to watch events/years. Which reminds me...I need to start the culling process for my daughter's 2nd Birthday Slideshow, design her invites, make a #2 Birthday T-Shirt, and get images loaded to Shutterfly for my wife to have on hand for photo books. AGAIN, congrats and hope all the info everyone wrote above is worth the read. I think considering how easy it is to create so many images, the key to making these images last and have impact is to heavily censor yourself. Not necessarily by taking fewer photos, but by being very selective in what you keep and what you display. So that those "here we are at the park...park again...here's another at the park...and the park" moments just become "here we are at the park", and it's simply the best one of the bunch, and none of the rest. Remember that there are a couple of things going on here. You are trying to document your child's life; you are the editor. That often ends badly, or at least inadequately. But there's also the question of what your CHILD will find interesting in the future. Those are somewhat different questions. Having gone throught tons of old family photos to scan them, I realized that the intentions of the original family photographers was different than my intentions. They were documenting say a trip to Yosemite; I was more interested in pics of my sibs at an early age. You see this in any Ken Burns documentary: the photos that are of interest to us now are often common everyday stuff, the rejects. The press photos of TR aren't nearly as interesting as some of the candids, accidental family photos, and whatnot. So you want to make sure you have lots of images of things that seem insignificant now. Sheesh, a serial box, newspaper cover (or just a newspaper), furniture, clothes, cars in the street, etc etc, could be interesting to your child years from now. Sure, make those nice albums with stuff you've edited. But leave the equivalent of a shoebox in the attic full of the dross of daily life for your child to find as well. And remember pictures of you are gonna be as important as pictures of your child. I know just what you mean, dmw. The physical sensation of turning the pages or passing the snapshots back and forth among friends and relatives or even by yourself can't be matched by huddling around a monitor or tv. I've been struggling with the same issue as I have started archiving photos and records in my family and at our church. Going one direction, photograph to file is much easier: just scan em all. The opposite direction is trickier though, digital to printed picture. Digital photography has allowed us to get much more liberal with the shutter button which means many, many more shots to sift through. We have pictures printed ourselves, and the only advice I have is to review each photographic event as if you would've shot it with film. That is, take those 100 pics of junior's birthday and pick out the best 12 or 15 and have those professionally printed. You'll still have the original 100 (with multiple backups, of course) but you will have the dusty album you can pull off the shelf years from now for the hands-on experience. Was that a scan from the negative... or just a really good scan from the photograph? And did you do any post-processing? I've got tons of photographs I want to scan... but I've never gotten good results in the past. I have a new Canon all-in-one but I haven't scanned anything with it yet. Maybe it will do a good job. We have 3 kids, ages 12/10/8, totally understand. -all digital content stored on the iMac, Time Machine Back-up; 3rd back-up is done once/month to spare HD in basement, 2 floors away. It's best I can do for physical separation in case of fire. We've watched the "younger" ones (kids age wise) countless times over holidays or a rainy day, the kids love seeing themselves as really young ones. It also re-enforces family values and bonding seeing those. Also, by being organized digitally allows my wife every year to make a Calendar, one for both side Grandparents (with that side grand kids in it and their lives events) then one for our family with mostly our kids/kids friends in it. I actually get 2 one for home and 1 for work. Each month of that year is the past years events, so ties those memories to dates also. LH is from 2007 and on right is 2013 calendar, these in my file cabinet. We've done select photo books for big events then, like parents 50th wedding anniversary, etc. Heck, by being digital that allowed all siblings to send us photos, we made a slide show and showed it on HDTV. Aftterward, included those with the party photos for a photo book. Thanks. I scanned the original print on a good quality Epson scanner when I was taking some design classes a few years ago. I did some cleanup work in Photoshop but nothing special. The print was in the original "Media Archive" (a shoe box) that my parents kept in a bedside chest. Using a Digital Asset Manager (DAM) is by far the best way of culling through your photos, and creating smart albums that only contain the best. Fewer than 1% of my photos make it into my collection of smart albums... and as a result... they are MUCH more interesting. I personally think Aperture is the best out there, but with Apple's decision to EOL it... I have a hard time recommending it anymore. Adobe Lightroom is also good... but I am holding out to see what happens with Apple Photos before deciding which path I take. Regarding the bolded section above. You can do better. Put a copy at a friends house, or someplace at work... or even the trunk of your car. Anyplace is better than the same house as your originals. Also, I would strongly consider cloud storage. It is very inexpensive, and would be the most secure of any of your existing options. What are your thought on Cloud Storage? (not trying to hijack this thread, but could be good) I've looked at some but not sure which is best (forgot what I looked at right now) and then thought of the Apple Photo iCloud version (we don't take nudes, so no worries there). I like 100% of my digital assets on a single machine which is backed up at least twice (one onsite and one offsite via cloud backup)... and also locally cloned. Hence, there are at least 4 copies of my data. All backups and clones are performed automatically with no human intervention. When it comes to my irreplaceable digital assets (my photos and my personal camcorder/phone videos)... then I additionally manually keep extra copies locked in my desk at work. Hence... 5 copies of my data. I am OK with cloud storage... but not as the primary place where my digital assets are stored. For me... cloud storage (vs cloud backup) would be the 6th copy of my data. Offsite storage is like home insurance, you don't need it till some catastrophic issue happens, I agree. I like the idea of using personal NAS for storage say among family members. Your vital files, tax documents, excel word files, etc. If you are a business then I 100% expect robust back up strategy including off location. For home use, what is truly needed? Good advice, and I would add: Three people should have the passwords to the files. If you get hit by a bus, your pictures are history.